States and healthcare systems that are making a concerted effort to respond to the alarming maternal mortality and morbidity rate in this country are discovering something important. Neglect, delayed diagnosis, and inadequate management contributed to poor outcomes in women with preeclampsia and other hypertensive crises in pregnancy. If you’re a healthcare provider, you should know that protocols for early warning systems, including a list of criteria that indicate urgent bedside evaluation, have been created to facilitate more timely recognition and more effective therapeutic intervention. While we don’t yet truly understand the entire cause of preeclampsia and there is no sure fire prevention or treatment, much can be done with what we do know today. Protocols for early warning systems, including a list of criteria that indicate urgent bedside evaluation, have been created to facilitate more timely recognition and more effective therapeutic intervention. While we don’t yet truly understand the entire cause of preeclampsia and there is no sure fire prevention or treatment, much can be done with what we do know today. The current definition of preeclampsia includes blood pressure of 140/90 or greater and protein in the urine OR one or more indications of other organ failures (thrombocytopenia, liver, renal, pulmonary, cerebral or vision). HELLP syndrome, a particularly dangerous variant, often presents without alarming blood pressures, but epigastric pain, vomiting and flu-like symptoms may be the hallmarks of the liver failure usually underway. Given this, it’s easy to see why MEWS is optimally organized to ensure that women like Lauren Bloomstein do not die from preeclampsia. But how is a patient to know what she should be alert to and consider worthy of engaging her providers? This is where deliberate, effective and, where possible, evidence-based patient education tools and techniques become critical. Lamaze instructors are in an excellent position to partner on these life-saving strategies. 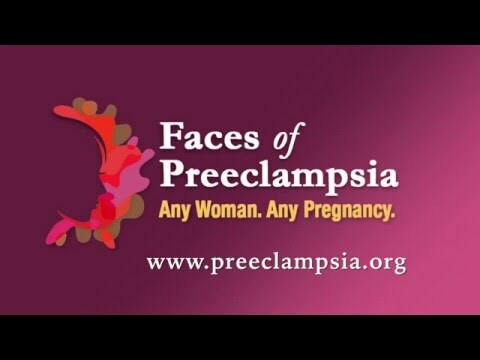 The Preeclampsia Foundation advocates for patient education to be offered throughout the prenatal care period and upon discharge. Women must be taught the symptoms of preeclampsia (see box below), understanding that these do not lead to a certain diagnosis, but are causes for immediate follow up. If she’s in the hospital or birth center before, during, or after childbirth, she or her family must advocate for immediate bedside assistance to evaluate her vital signs, call for blood work or further testing, and determine if her care must be escalated. Hypertensive disorders like preeclampsia and HELLP syndrome can worsen quickly! Adult learning techniques and evidence-based tools like the Preeclampsia Foundation’s tear sheet, clinic poster, and video can aid care providers, childbirth educators, doulas. More important than any tool is the attitude that care providers have toward patient education. It should be deemed as important at all levels of healthcare (administration to med techs). And it should reflect the fact that all of us learn differently, with varying amounts of health literacy and different perceptions of our roles within the healthcare environment (i.e., is the doctor the defacto expert or does the patient have a proactive role to play?). This is an opportunity early in a woman’s life course to empower the mother to understand and become an active participant in her and her new baby’s health, a lifelong skill, and increasingly a necessity as we are called to navigate a complex healthcare system. More information about Maternal Early Warning Signs, and especially patient education techniques and tools, is available through this webinar audio recording and slide deck sponsored by the Council on Patient Safety in Women’s Healthcare. Lamaze Certified Childbirth Educator Jessica Deeb, MS, RN, WHNP-BC, IBCLC, LCCE, joined me as co-presenter, bringing valuable tips about effective adult learning. Main, Elliott K., McCain, Christy L., Morton, Christine H., Holtby, Susan, Lawton, Elizabeth S., “Pregnancy-Related Mortality in California: Causes, Characteristics, and Improvement Opportunities.” Obstetrics & Gynecology. April 2015. Mhyre, Jill M., D’Oria, Robyn, Hameed, Afshan B., Lappen, Justin R., Holley, Sharon L., Hunter, Stephen K., Jones, Robin L., King, Jeffrey C., D’Alton, Mary E., “The Maternal Early Warning Criteria: A Proposal from the National Partnership for Maternal Safety.” Obstetrics & Gynecology. October 2014. “Hypertension in Pregnancy.” The American College of Obstetricians and Gynecologists. 2013.